Even President Obama is using Foursquare. Why aren't you? Lady Gaga may rule on Twitter, but President Barack Obama earlier this week officially became Foursquare's most renowned user yet. Now, the rest of us will get to see where the most powerful man in the world visits with foreign leaders, speaks at town hall events, and, who knows, maybe he'll tell us where he goes on vacation. 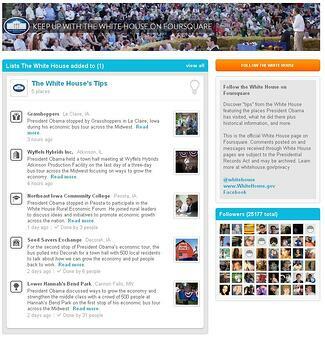 The White House has stated that it will utilize President Obama's Foursquare page to promote a current economic bus tour as well as future events. And with the 2012 Presidential election just over a year away, the White House will undoubtedly push campaign-related stops and get the President's message out. It's never too early to start campaigning, right? While the President's reason for joining Foursquare may not be to become "Mayor" of the White House, he will use the platform to promote himself - something your business could be doing, too. Tools like Foursquare, Yelp, Urban Spoon, and Google Places are designed to help you get the word out about your business by encouraging your customers to interact with you online and through promotion of your physical location. Whether you offer discounts or giveaways or simply allow the word-of-mouth magic of Foursquare to do the work for you, driving local customers to your establishment is always a good thing. Foursquare and similar services combine the strategy of local search and the authority of social media to target people in your area who may be interested in what you have to offer but may not be acquainted with your business yet. With local search on a continuous rise and hundreds of millions of users on social media platforms, it's in your business's best interest to get yourself on Foursquare. Need some help incorporating Foursquare into your social media marketing strategy? We live and breathe social media at LyntonWeb and are happy to help. Give us a call, contact us online, or be really hip and stop by for a consultation. Don't forget to check in to Foursquare when you're here!